The FT-325 is a highly engineered, thoroughly testes workhorse. It's designed to work with the natural movement of the body and produce outstanding results for everyone, from first-time users to serious athletes. The FT-325's dual weight stacks provice fully independent motion and asymmetrical loads for single users, or they can serve as individual stations, so two people can work out at once. FUNCTIONAL TRAINING: BIG PERFORMANCE. Compact Package. The CYBEX FT-325 is a high performance, commercial-grade functional trainer that delivers an expansive range of exercises in a single, compact, low-profile unit. Which makes it the right fit for facilities where space is an issue, but getting a great workout is essential. The FT-325 is a highly engineered, thoroughly testes workhorse. It's designed to work with the natural movement of the body and produce outstanding results for everyone, from first-time users to serious athletes. 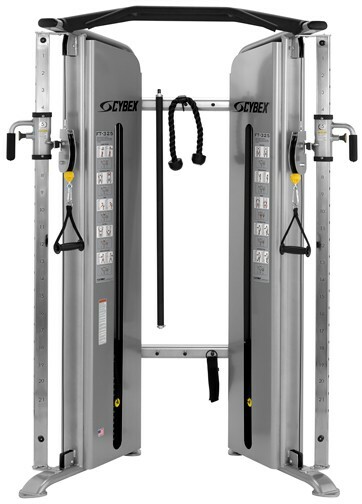 The FT-325's dual weight stacks provice fully independent motion and asymmetrical loads for single users, or they can serve as individual stations, so two people can work out at once.